Originally built between 1955 and 1957 as a gift to the people of Alberta, the mandate of the Northern Alberta Jubilee Auditorium is to provide a place of celebration where community spirit and cultural enrichment thrive. Today, the rejuvenated Jubilee Auditorium continues its tradition of public service. In addition to playing host to the world through exciting performances, the Jubilee is Northern Alberta’s premier event space. it’s all at the jube. 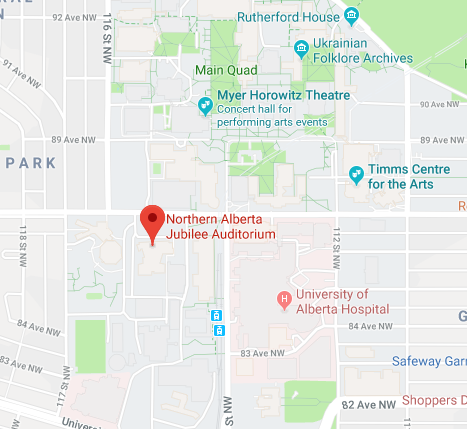 The Alberta Jubilee Auditorium is fully wheelchair accessible (with the exception of the 2nd balcony) with ramps available at the north entrance. Wheelchair seating at the Alberta Jubilee Auditorium requires a ticket and is priced according to each performance. Please be sure to specifically request a wheelchair space when calling to purchase tickets. 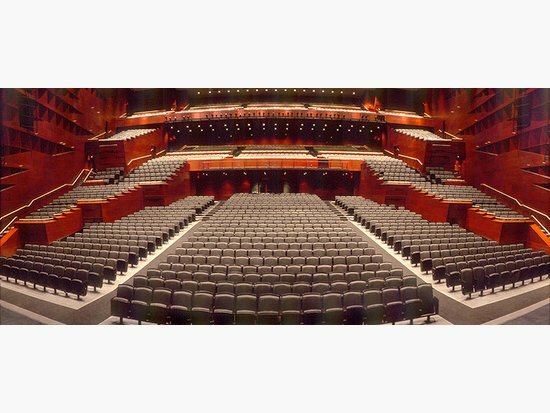 Wheelchair patrons and one guest have the opportunity to purchase seating at regular prices for an event and occupy seats together at a number of locations throughout the orchestra level, first balcony and pit level seating. Please refer to the seating plans for locations. Since wheelchair spaces are limited, additional group members are not guaranteed seating near the wheelchair patron but we will make an effort to accommodate groups according to availability. Handicapped parking is available in our parking lot located directly west (SAJA) or east (NAJA) of the auditorium, with an additional six spaces available in the parking area by the north doors. Handi-Bus parking is available on the northwest side of the building (SAJA), or wheelchair patrons may be dropped off at the main or east entrance ramps (NAJA). The Alberta Jubilee Auditorium does not provide wheelchairs to its patrons. Binoculars may be rented at every event. Please check with the Patron Services Booth in Main Lobby next to coat check. At the Jubilee, we have two assisted listening devices to choose from to help enhance your experience. Regulate volume through switch on the bottom front. This is most popular model and can be used by everyone who does not have a hearing aid. If the patron has a hearing aid they will need to remove the aid or use the other model. Consists of two parts: a receiver and the listening device loop; these are generally used by patrons who have hearing aids. Receiver can hang around neck; regulate volume through switch on the bottom front. With the loop pack system, one of two listening device loops must be attached to the receiver to bring the sound to the patron. Loop goes around neck – sound waves transmit up to the hearing aid – most popular mode. Individuals are welcome to bring service dogs to the Jubilee Auditorium. Service dogs on duty are recognized by a proper harness.